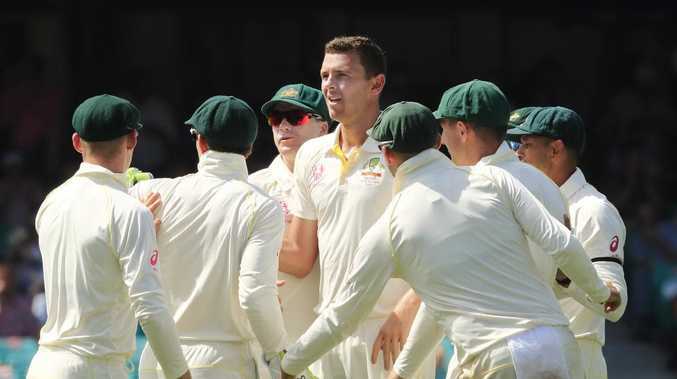 AUSTRALIA suffered through pure cricket hell on day two at the SCG, watching helplessly while India took another step towards securing a historic series win on Australian soil. The tourists - led by Cheteshwar Pujara and Rishabh Pant - batted the Aussies out of the game and the series on a sweltering day in Sydney, where records fell like flies in another humiliating chapter for the hosts as they ended the day 598 runs behind the tourists. Resuming on 4-303, Pujara started the day on a personal tally of 130 and continued where he left off on day one. He was patient in the morning but happy to set upon anything loose from Marnus Labuschagne's part-time leg-spin as he passed 150 to record his highest score outside India. 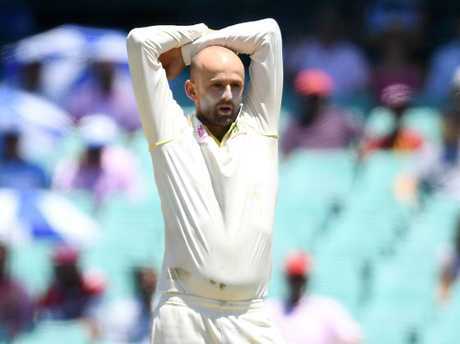 The classy first drop, who had already posted tons in Adelaide and Melbourne, surged to 193 before chipping a return catch to Nathan Lyon and rocking his head back in dismay because he'd given up the rare chance to tick off a double century on foreign soil. 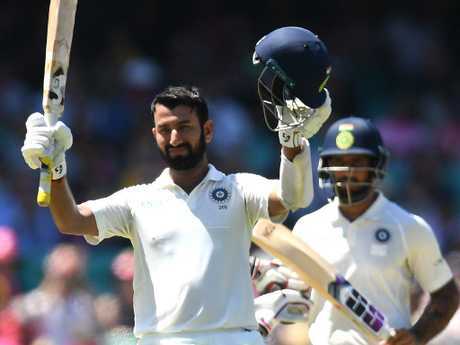 Pujara has faced 1258 balls in the series so far - making history for the most deliveries faced by a visiting batsman in a four-Test series in Australia. His wicket followed the controversial dismissal of Hanuma Vihari in the first session, when the third umpire ruled he got a thin edge on a Lyon delivery that was snaffled at short leg. Vihari challenged the decision immediately and was in shock when given his marching orders, convinced he didn't hit the ball with bat or glove. But the joy that accompanied his departure was short-lived for Australia because it brought wicketkeeper Pant to the crease and he unleashed a rampage of his own in partnership with Pujara. The pair put on 89 runs for the sixth wicket and when the No.3 got out, Pant took centre stage. He belted 15 fours and one six as he compiled his second Test century in just his ninth match in the whites. He already became the first Indian wicketkeeper to score a Test century in England earlier this year and on Friday he became the first Indian gloveman to reach three figures in Australia. He finished on 159 not out, recording the second highest score by a visiting keeper Down Under, behind only AB de Villiers, who once scored 169 in Perth. The 21-year-old Pant can add youngest keeper to score a ton against Australia to his list of achievements, sharing in a 204-run seventh-wicket stand with with Ravi Jadeja. Pant also passed Virat Kohli on the list of leading run-scorers this series, moving into second behind Pujara. Pant's partnership with Jadeja was the best for the seventh wicket in a Test in Australia and only came to an end when Jadeja danced down the track and tried to deposit Lyon out of the stadium but took an air swing and was bowled for 81. Kohli couldn't be criticised if he'd wanted to bat into day three, because India needs only a draw to maintain its 2-1 lead and become the first Indian team to win a Test series in Australia. But he thought his troops had battered the Aussies enough and declared at 7-622 when Jadeja had his stumps rattled. None of the Aussie bowlers will want to look at their figures. Lyon was the best with 4-178 as he sent down 57.2 overs to rack up 1445 balls for the series - the most sent down by an Australian in a four-Test series since 1970. Mitchell Starc failed to bowl a maiden in 26 overs as he picked up just the one scalp while conceding 4.73 runs per over and 123 in total. Josh Hazlewood tried hard and picked up 2-105 in 35 overs, but Pat Cummins went wicketless from 28 overs. Labuschagne, recalled to the national team because selectors valued his part-time leggies, had no joy as he ended with 0-76 from 16 overs. Kohli's declaration meant Australia's opening batsmen had 10 nervous overs to deal with at the end of the day. Usman Khawaja was given a life when he was dropped by Pant, who spilled a simple chance behind the stumps after the left-hander got an outside edge to Mohammed Shami. Marcus Harris ended the day on 19 and the hosts will resume on Saturday on 0-24.